One of the ideal characteristics of a Librarian 2.0 that came out of a FB group discussion was ‘courage’, and it was courage that took me to the launch party of the Jokaydia Unconference 2010 earlier today in Second Life (SL). Daunted at first, as my avatar manipulation skills still leave a lot to be desired, and lacking in confidence regarding my ability to converse about SL and its applications in the ‘real’ world, the other attendees soon put me at ease and I was able to use voice and text chat with the group and listen to some interesting discussions on using a virtual world platform in universities, even if at times it was a little distracting to have to follow the conversation via text and voice simultaneously. 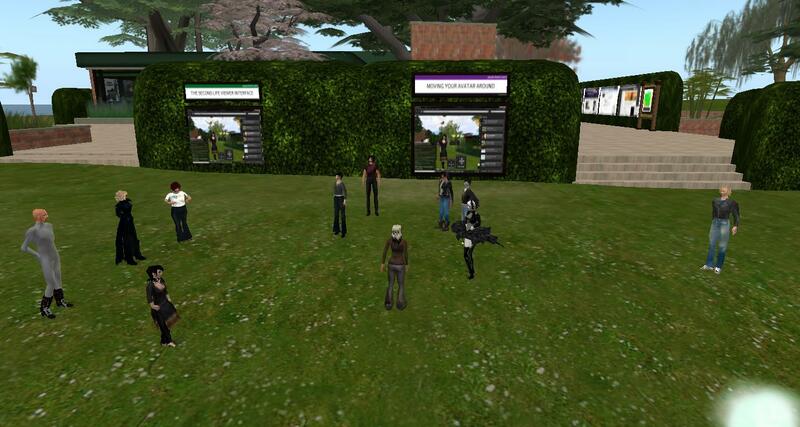 It was amazing to be talking with people as far away as Scotland and Sydney, as if we were all in the same room, which we were in a way, and it’s this ‘visual context’ that virtual worlds offer that can be such a benefit, for example, to distance education students, creating a sense of actually being in a real class together (Zhang, 2007). As SL has developed over the last 6 years, it has become more attractive to educators (more than 100 educational institutions had signed up by 2007, (Joly, 2007)): because as (Kirriemuir, 2009) reports, there is no requirement for an additional server, an established community of ‘experienced practitioners’ is on hand, and a number of previously-created objects and structures can be obtained cheaply or free. But creating an effective virtual classroom is not too be taken lightly as overall it can be costly, not only in monetary terms, but in terms of time and human resources required to both set up and then maintain the facility (Joly, 2007). David Olsen has just reported on a recent Australian survey finding that 1 in 5 people would refuse a job that bans Facebook. Workers who often work at home after hours want in return to access social media (SM) at work. If used responsibly SM shouldn’t be a major issue, and, as Dane Larson writes in a blog regarding the benefits of SM in the workplace, it encourages teambuilding, communication and collaboration, but it’s where a SM policy is now a real must for organisations. 1. Set expectations for behaviour – Boundaries should be set on what employees can and can’t do, and how they should behave, whether using SM for work or personal use in the workplace (Fleet, 2009); Hartshom, 2010), and the consequences of violating the policy. They need to be responsible for what they write (Lauby, 2009a), and respect others, including writing about colleagues only with their permission (Anderson, 2009). Copyright must be respected, including links to sources cited in a blog (Kroski, 2009). 2. Complying with organisation’s existing policies – This includes non-disclosure by employees of an organisation’s confidential information, in addition to anti-harassment policies, company ethics etc (Fleet, 2009; Lauby, 2009b, regardless of what type of SM is being used, and when and where it is being used (Flynn, 2009), as well as prohibiting the downloading of any illegal software or materials whilst in the workplace or using an organisation’s computer or network (Lotito, 2010). 3. Protect personal information – employees should be reminded to protect their privacy (Defren, 2009) and not disclose any information that might jeopardise their safety, or be used against them in any way. 4. Be transparent – employees should write under their own name and reveal their affiliation with their employer if their post mentions the organisation, or matters relating to it (Defren, 2009). A disclaimer should be added stating that the views expressed are the author’s own and not necessarily those of the organisation (Kroski, 2009). 5. Keep it short and simple – the policy needs to be easily understood by all employees (Dand, 2009), and as web 2.0 technology changes rapidly, be easy to update on a regular basis. Flynn, N. (2009). The e-policy handbook (2nd ed.). New York: American Management Association. To share information – WL and AADL post job vacancies on Facebook pages. All three share photos on Flickr of library events. ML uses webcasts through the Vimeo platform to share author talks. AADL makes use of podcasts to share library talks and author interviews, and posts news, services and events in the local community on its community blog. To promote events and services – WL promotes news, events and library services through Facebook and Twitter. AADL uses Facebook primarily to promote events, but it has numerous blogs that include services, events and exhibits, and library news. A presence on social media sites can also attract potential new users through serendipitous browsing who might otherwise be unaware of the library and what it offers (Houghton-Jan, Etches-Johnson & Schmidt, 2009). To engage with users – all three post blogs that encourage user comments. This can lead to conversations, which in turn can provide valuable information about what users want (Burkhardt, 2009). AADL also encourages user to tag its collections and provide book reviews, giving users a sense of ‘ownership’ (Springer et al., 2008, pp. 35-36). WL has a number of children’s storytime videos on YouTube to help engage with the youngest members of their community. Facebook, Twitter and blogs can also be used to good effect to solicit feedback from users. To communicate – provides additional means of being in touch with patrons. Instant messaging and Facebook are how many young users in particular now communicate, so go where the users are (Burkhardt, 2009). WL has teen Facebook page, as does ML although neither has many fans (ML only 6, though a lack of library promotion of this site may have a bearing!). WL also uses MySpace to host its teen site, which includes a teen blog. WL offers a mobile interface for both its website and OPAC, as well as instant messaging. To provide user-education – AADL has a research blog, which aims to provide information on a wide range of research tools. The two courses I’m currently studying (INF517 Digitisation and this INF506 Social Networking course) have most satisfyingly come together through the social media site Flickr, and in particular, a designated space known as The Commons, where a number of esteemed cultural heritage institutions, including the Library of Congress, and the National Maritime Museum, are uploading photographs from their digital historical image collections. They are turning to this social media platform to share selected photographs with the massive Flickr membership, thereby increasing awareness of their collections, but also to engage users with the images by encouraging participation in social classification – creating metadata by adding their own tags to describe the image, in addition to comments (Springer et al., 2008, p. iii). Other users can assign their own tags, collaborating to build a number of keywords ‘in the actual language of users’ to facilitate easier browsing and retrieval (Matusiak, 2006, p. 289). In many cases, the institutions have little information about the images, or a lack of time and resources to provide metadata, therefore drawing on the collective expertise of users, has enabled them to correct and update descriptions, and increase the likelihood of retrieval (Springer et al., 2008, p. iii). Many public libraries now offer a facility for user tagging, although a suitable tag for one user could offend others as Mount Prospect Library has discovered. A library needs to tread a fine line between ensuring offensive tags are removed, but not over policing thereby discourage users from contributing. Jonathan Furner wrote an excellent paper on user tagging of library resources which discusses user tagging in some detail, including its benefits, considerations libraries should make before offering enabling users to share their tags, and criteria for evaluating the success or otherwise of this Library 2.0 tool. And of course I shouldn’t forget to mention wikis, most notably wikipedia, which rely on a collective group collaborating to create and edit content on a vast scale. The more that participate, the better the wiki becomes (Fraser & Dutta, 2009). Fraser, M., & Dutta, S. (2009). Throwing sheep in the boardroom: How online social networking will transform your life, work and world. Chichester, West Sussex: John Wiley & Sons Ltd.
Matusiak, K.K. (2006). Towards user-centered indexing in digital image collections. OCLC Systems & Services: International Digital Library Perspectives, 22(4), pp.283-298. Tay, A. (2009). Libraries and crowdsourcing – 6 examples. Retrieved May 16, 2010 from http://library20.ning.com/profiles/blogs/libraries-and-crowdsourcing-6. Well one down and one to go. Just pressed the button and send Assignment 1 off, which is both a good and a scary thing as a) I’m relieved it’s done and out of the way, but b) I’ve the usual post-assignment niggling doubts about what I’ve written and whether it’s really up to scratch. I believe my paper, ‘Using social media to connect with prospective students and the lessons Qatar-based campuses can learn from their US counterparts: A case study (and a rather long mouthful) could have been better if I had been able to look at both prospective AND current students, as was the original intention, but I simply couldn’t get it down to anywhere near the required word count… But what’s done is done, and time to move forward on my social networking learning curve. I have to say that despite initial reservations, I am enjoying using Facebook as a vehicle for interacting with my INF506 classmates and feel it works better than the Interact forums. It’s definitely more social and personal which is a good thing for distance learners who all too often can feel very isolated and alone. Even just having a little thumbnail image of each member really helps. The majority of the group seems to have come together very well through the Facebook postings and there seems to be more willingness to share good articles, post tips, and generally provide support, than I’ve experienced in other courses. Yes, the 4cs of collaboration, conversation, content creation, and community are certainly alive and kicking, and it’s great to be actually experiencing a concept that we’re studying. How can AnnaLaura Brown’s A-Z of social networking for libraries be applied to a library I know to help it embrace a Library 2.0 ethos? Georgetown University School of Foreign Service in Qatar Library currently serves 300 students, faculty and staff, plus approximately 300 public patrons. The collection of nearly 50,000 volumes started in 2005 will increase by approx 10,000 annually until maximum capacity of 125,000 is met. Its online catalogue is shared with the university’s main campus library. Marketing and promotion tends to rely primarily on word of mouth. The current library website is functional but offers little in the way of Web 2.0 technologies, and no social media. So where to start to help this library embrace a Library 2.0 ethos to connect more fully with its users? D- Direction. Before installing or applying any social networking (SN) tools, the library needs to be clear about how they will help it meet its goals. Will a Facebook fan page help attract new patrons, for example? What is also vital if it wants to embrace Library 2.0 is that the focus is user-centric, so it’s important to establish what the community wants and expects from interactions with its library before then installing the appropriate SN tools to help satisfy these user needs (Casey & Savastinuk , 2007). Z-zeal. Now it needs to get all the library staff involved and excited about Web 2.0 and social networking. Offering the 23 Things program would be a good start. Y- Youth. With a Higher Education Research Institute survey finding 94% of first-year university students visiting SN sites in any given week, the library must seriously consider using social networking to go where the users are. As Sophie Brookover notes in Library Journal.com, connecting and interacting with students by using tools with which they are very comfortable, demonstrates an awareness of and participation in trends that matter to them. B- Blog. Regular blogs from library staff on various subjects, eg., new title reviews, promoting new databases, and tips on searching, would provide an excellent way to communicate and share information with users. Social media consultant Victor Lavrusik observes that inviting users to comment starts conversations, an important component of Library 2.0. G-Good Reads. A simple way of creating content and sharing information to provide an added service to readers. Even better, collaborate with users and get them to write reviews! With just these 5 letters the library can take its first steps on the path to becoming a Library 2.0.